The example in the book replicates work done by Murnane, et al. (1999). In their paper they analyzed wage data for high school dropouts and investigated whether (log) wage trajectories remained smooth functions of work experience. Their idea was that obtaining a GED might command a higher wage and thus cause a discontinuity in the linear model fit to the data. The authors partially replicate this work by fitting a taxonomy of multilevel models. That’s not exactly fun to look at either, but the last few terms reveal the random effects. The is the random effect for the intercept, is the random effect for the EXPER slope parameter and is the residual error. The key part is the stuff in the parentheses. It says EXPER - and the intercept by default - are the random effects, and that they're grouped by ID (ie, the individuals). This means that each individual has his own intercept and EXPER coefficient in the fitted model. Let's look at the model's fixed effects and the random effects for individual 1. Notice how the intercept and EXPER coefficient are different for the individual versus the fixed effects. Now we're usually less interested in the specific random effects (in this case there are 888 of them!) and more interested in their variances (or variance components). The variance component for the intercept is 0.051. The variance component for EXPER is 0.001. Those are pretty small but not negligible. Having said all that, the goal of this exercise is to build the best model with discontinuities, which is largely done by deviance statistics. So let's work through the book's example and remember that everything I explained above is the baseline model. All subsequent models will build upon it. Notice how GED flips from 0 to 1 over time. 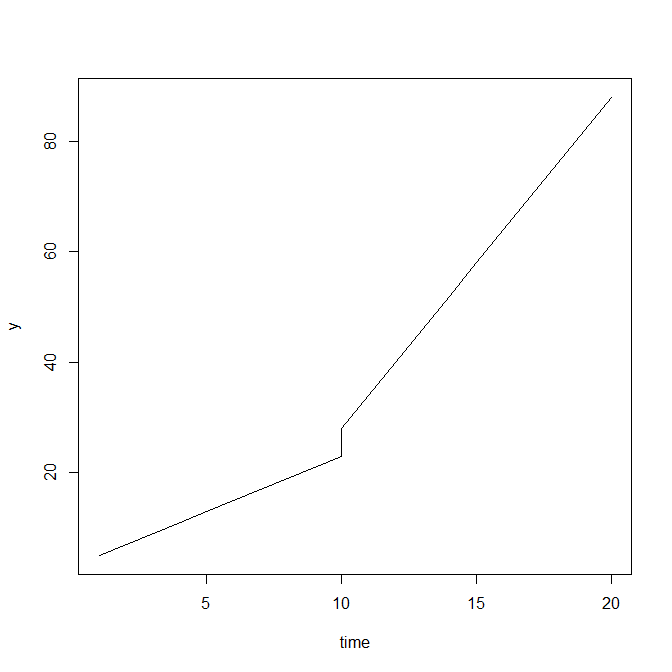 Model B allows an individual's wage trajectory to shift in "elevation" at the point GED changes to 1. Hence the discontinuity. Should we allow this? Calling anova(model.a,model.b) helps us decide. In the output you'll see the p-value is less than 0.001. The null here is no difference between the models, i.e., the new explanatory variable in model B (GED) has no effect. So we reject the null and determine that an individual's wage trajectory may indeed display a discontinuity in elevation upon receipt of a GED. This is our baseline model with an additional fixed effect for GED. Should we include random effects for GED? Again we test the null that there is no difference between model B and C by calling anova(model.c,model.b). Since model C is nested in model B and the p-value returned is about 0.005, we reject the null and decide to keep the GED random components. The record where GED flips to 1 is the day he obtains his GED. The next record clocks the elapsed time in the workforce since obtaining his GED: 1.402 years. POSTEXP records this explicitly. But that's what EXPER records as well: 3.128 - 1.726 = 1.402. So these two variables record the passage of time in lockstep. It's just that EXPER records from the "beginning" and POSTEXP records from the day of GED attainment. Allowing this additional variable into the model allows the slope of the wages trajectory to suddenly change when a GED is obtained. OK, enough talking. Let's see if we need it. The p-value returned from the anova function is about 0.01. This says model D is an improvement over model A and that the trajectory slope of wages indeed changes upon receipt of GED. The next model is model D without random effects for POSTEXP. So whereas previously we allowed the change in slope to vary across individuals (random), now we're saying the change in slope is uniform (fixed) for all individuals. In the R code this means removing POSTEXP from the random effects portion but keeping it as a fixed effect. The results from this anova test conclude no difference between the models (p-value = 0.34). This means we may not need to allow for POSTEXP random effects. But before we go with that, let's fit a model that allows for discontinuity in both the slope and elevation of the individuals' wages trajectory. In other words, let's throw both GED and POSTEXP in the model as both fixed and random effects. And then let's compare the model with previous models to determine whether or not to keep each predictor. Notice the shift in elevation at 10 and then the change in slope after the shift in elevation. 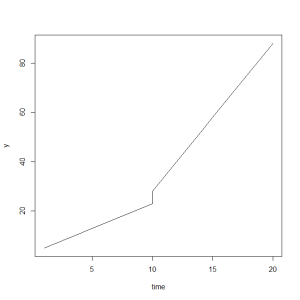 This entry was posted in Longitudinal Data Analysis, Multilevel Modeling, Using R and tagged ALDA, discontinuous change, lme4 on September 21, 2013 by Clay Ford.